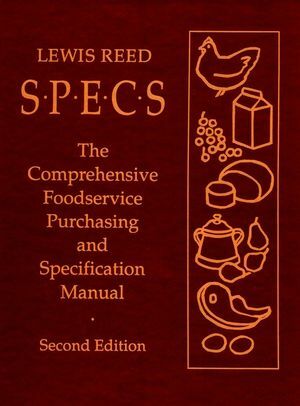 SPECS: The Foodservice and Purchasing Specification Manual is a must-have reference manual for the standards by which food is measured, specified for purchase, and inspected upon delivery to ensure that the foodservice operation is getting the value it is paying for. * The theory behind specifications: Why do we need specifications? Who develops them? Who uses them? LEWIS REED received a culinary arts degree from Santa Barbara City College, a bachelor of science degree in hotel and restaurant management from Cal Poly Pomona, a master's in hospitality administration from University of Nevada, Las Vegas, and a PhD in education administration from Washington State University. He has taught at Santa Barbara City College, University of Nevada, Las Vegas, and Washington State University. His experience in the hospitality industry includes jobs as a waiter, a purchasing agent, a cook, a chef, a manager, and an owner, all of which contributes to his inside knowledge and appreciation of the industry. He currently owns two restaurants and is a franchisee of a national chain. 2. Fruits - Fresh and Processed. Appendix A: Quality Controls and Federal Regulations. Appendix B: Food Purchasing Guide.